If you are homeschooling your child with special needs, finding a curriculum and suitable work activities can be very difficult and frustrating. This is why we recommend ABC and 123, a friendly to use curriculum compiled especially for the pre-school child and can be modified for older or special needs children too. If your child has developmental delays, or is struggling to learn, this programme is an excellent, extra supplement to their early intervention programme. What is ABC fun and 123 all about? ABC Fun and 123 allows you to spend more time with your child, doing the things that you love, together. With this programme you dont have to spend time looking for activities. AbC Fun and 123 offers age appropriate learning materials, although it is aimed at pre-schoolers, but remember, it can be modified for older children and even children with special needs. Please Note: This is not phonics or a reading programme! It is only intended to be used as a fun introduction to letter and numbers, for younger children who are not yet ready for a formal phonics program. This is also not a maths curriculum, simply a fun way to introduce your child to numbers and number concepts at home. Encouragement for when doubt comes! Lesson planning to help you schedule your day. Overview of learning activity categories. This whole package will cost you less than $1 a day! With your purchase of ABC Fun 123, you also get eBook of Beatrix potters The tale of peter rabbit, absolutely FREE! 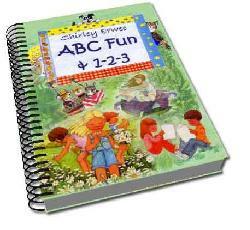 Order the ABC Fun and 123 homeschool curriculum now and have access to all the fun activities immediately.